As a belated birthday dinner, I decided I wanted crabs. And where do you go for crabs around here? Chickie’s & Pete’s, of course. We hopped on down to the one by the stadiums, you know, the huge one. It was a weekend night and man, for a place that’s almost the size of a football field, the place was completely mobbed. I didn’t even think it would be, but it was. Seriously folks, the place is so, so, so, so big. And yet it was so, so, so, so crowded. So we headed to one of the bars and grabbed a couple of drinks while waiting for a table. I got a beer and R wanted a girly drink that didn’t taste like alcohol. 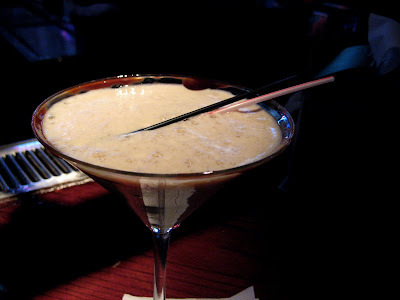 So she got one of the chocolatey martinis. You know what? This thing totally tasted straight up like chocolate. You couldn’t taste a bit of alcohol. It was unbelievable. We both ordered the snow crab legs. R also ordered a bowl of their seafood chowder. The stuff is really good, and chock full of tons of different seafood. 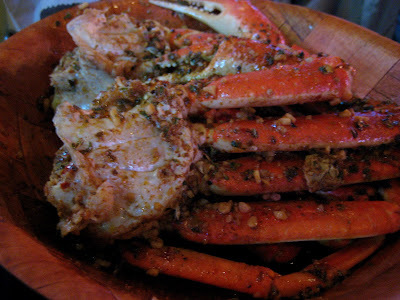 The snow crab legs are steamed in a tomato-y, old bay, and very garlicky broth. I mean seriously, it’s pretty much all garlic. Not only will your hands stink of crab, but your breath will be garlic-riffic. For those of you who say crabs are too much of a pain to eat, I say who cares! Sometimes, it’s good to have to work for your food. Since these are big legs and not the little maryland crabs, it’s not too difficult. And there’s tons of meat in these puppies. We did both have slight crab cracking accidents, as shells went flying everywhere. R even hit a waitress, it was pretty sweet. Which isn’t a bad thing, as the service here isn’t too hot. I mean it’s not terrible, but it’s not that great either. But they probably have too many tables, so I can’t blame them to much.